Modi said, “The BJP government is committed to preserving the rights of the Kashmiri Pandits, the displaced Kashmiri brothers and sisters, and is devoted to their dignity and pride”. Prime Minister Narendra Modi on Sunday said his government was dealing strongly with terrorism and was committed to making Kashmir terror-free. Modi was addressing a massive rally near the international border (IB) at Vijaypur in the Samba district of Jammu and a gathering in Srinagar. He also flew to Leh and Srinagar to inaugurate, lay foundations, and launch projects worth about Rs 45,000 crore. Among other projects, he laid foundation stones of two All India Institutes of Medical Sciences (AIIMS) in Vijaypur in Jammu and Awantipura in Kashmir that would double the MBBS seats in the state. Earlier, he launched the University of Ladakh, which is the first ever cluster university in the Ladakh region. This was Modi’s first visit to Jammu and Kashmir after the BJP withdrew support to Mehbooba Mufti’s PDP in June last year. Modi said that his government was committed to weed out terrorism and make Kashmir again a peaceful tourist destination. Paying tributes to soldiers martyred in anti-terrorist operations, including Nazir Ahmad Wani and Aurangzeb, he said that J&K’s youth like these soldiers show the entire country to live for the nation. The government will stand with the family of each martyr, he stressed. He said that the government was constructing about 14,000 bunkers along the IB and Line of Control (LOC) where residents were frequently facing unprovoked firing by Pakistan. Modi, in his public meetings and interactions at Jammu, Srinagar, and Leh, launched a frontal attack on the Congress, thereby launching the BJP’s election campaign. He said that the previous Congress governments had the tendency to ignore the necessities and sentiments of the country. “Take Kartarpur corridor for instance. Had they paid attention, then the land of Guru Nanak Dev would have been a part of India,” he said. Further attacking the Congress governments that recently dislodged the BJP and came to power in Madhya Pradesh, Rajasthan, Chattisgarh, and also in Punjab, he accused them of “fooling” the farmers by announcing loan waivers that have proved to be a failure. “The Congress party gets the fever of loan forgiveness as soon as the elections are near, once in 10 years,” said the PM. He said that Congress has never proposed to free the farmers of debts. But in the name of farmers, Congress has always filled the pockets of intermediaries. For the first time in 70 years of the country’s history, the BJP government has made a provision under which more than 12 crore small farmer families, who have land of up to 5 acres, will now get Rs 6,000 every year in their bank account. “We have left behind the culture of delays and corruption”, he said. 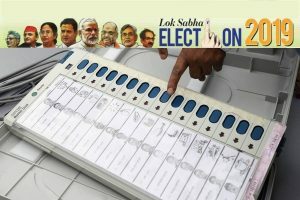 Referring to the recently held Panchayat elections in J&K, Modi complimented the people for peacefully holding these elections in which about 74 percent voters exercised their franchise. 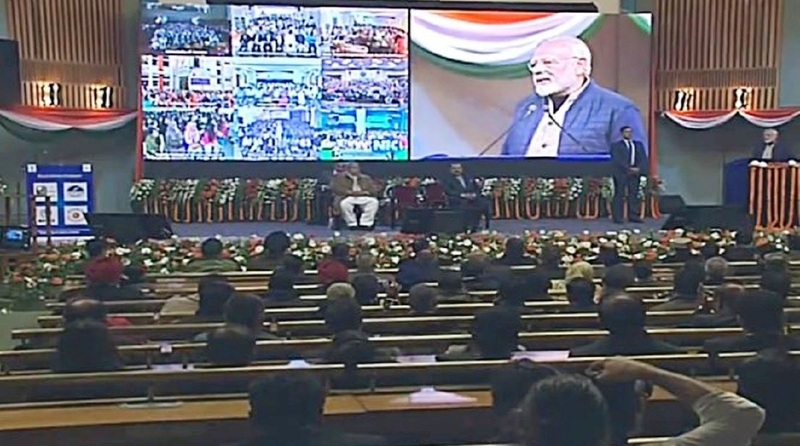 The PM also listed the projects that have been taken in hand to enhance connectivity in the state by laying a network of roads, bridges, and tunnels. Earlier in the morning, Modi was given a warm reception in -13 degrees Celsius at Leh. He said that the new terminal at the Leh Airport would improve the facilities and once the Bilaspur-Manali-Leh rail line is completed, the distance from Delhi to Leh will be reduced. It will also benefit the tourism sector. He said that the government was taking steps to further promote tourism in Ladakh where five new trekking routes have been thrown open and the Protected Area Permit’s validity has been increased to 15 days from 7 days at present. While in Srinagar, Modi interacted digitally with students across the country.